In March 2015, before any of the Democratic candidates had formally announced their candidacies, 41% of Democratic voters named Hillary Clinton as their first choice for the nomination. About as many said they were undecided (39%), while the next most popular choice was Elizabeth Warren (10%). By August 2015, after Bernie Sanders’ entry into the race and Warren’s decision not to run, Clinton’s support had dropped slightly to 38% of Democratic voters. 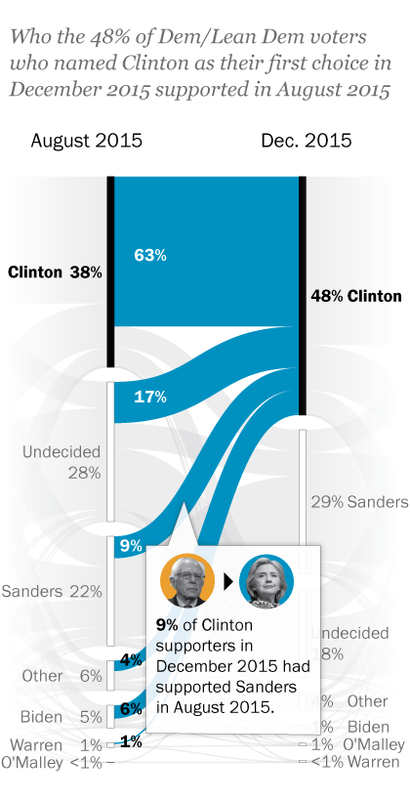 Many of Warren’s March supporters moved to Sanders (56%, compared with 12% who moved to Clinton). Still, Clinton held on to the support of most of her March supporters over this period, and picked up some support from previously undecided voters. 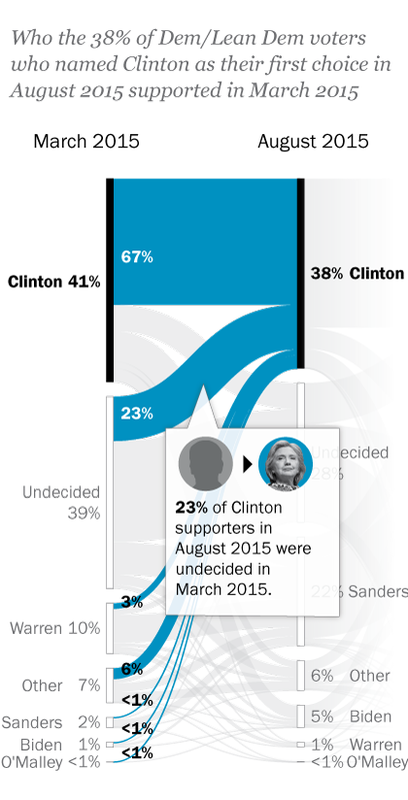 Clinton's support grew in December to nearly half (48%) of Democratic voters, while Sanders stood at 29%. Some Democrats changed their minds over this period: About one-in-ten of Clinton’s December supporters (9%) had backed Sanders in August, while a similar share (15%) of his December supporters had previously backed her. By April, deep into the primaries, Clinton’s overall lead over Sanders had narrowed substantially, as he gained more supporters during this period: 74% of her April supporters had supported her in December; by comparison, 59% of his April supporters had been December supporters. After Clinton clinched the nomination and became the presumptive nominee, most Sanders supporters came to back her in the general. As of June, Clinton is the choice of 90% of Democratic voters (including 90% of Sanders’ April supporters) in a general election matchup against Donald Trump. 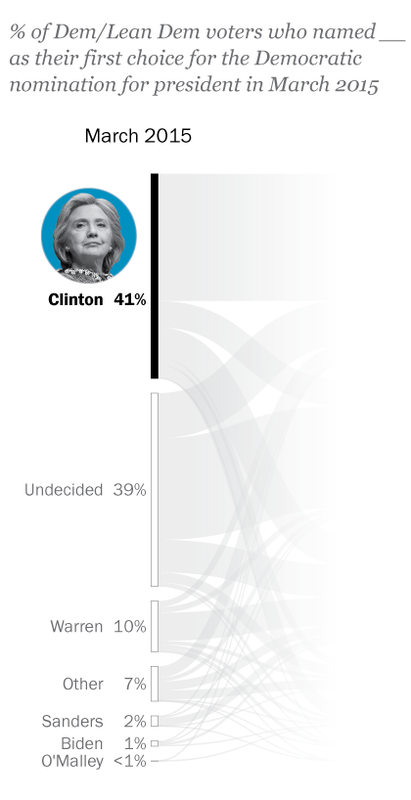 41% of Democratic voters named Clinton their first choice in March 2015. 38% of Democratic voters named Clinton their first choice in August 2015. 48% of Democratic voters named Clinton their first choice in December 2015. 46% of Democratic voters named Clinton their first choice in April 2016. 90% of Democratic voters named Clinton their first choice in the general election. Source: Pew Research Center American Trends Panel surveys, conducted March 2015 through June 2016. Based on Democratic and Democratic-leaning registered voters (March & August 2015, N=1,518; December 2015, April and June 2016 N=2,353). See methodology for more detail. Source: Pew Research Center American Trends Panel surveys, conducted March 2015 through June 2016. Based on Democrat and Democrat-leaning registered voters (March & August 2015, N=1,345; December 2015, April and June 2016 N=2,079). See methodology for more detail.